Insert your USB flash drive to your computer which you want to make bootable. Open command Prompt Run as Administrator: Search for ‘cmd’ in Windows 10 from the taskbar, Command Prompt will appear. Alternatively, you can also open the Command Prompt by pressing windows+R at the same time and typing in ‘cmd’ in the ‘Run’ window and hitting enter. Right click on Command Prompt and select ‘Run as Administrator’ in case you have searched for cmd in the Windows 10 Taskbar. Once the Command Prompt window appears, type diskpart and hit enter. The diskpart utility will run run in another window. In the new diskpart window, type list disk and hit enter. It will show you all active disks on your computer. Most probably, you will see two Disk types. Disk 1 for your USB Flash Drive with its total capacity. Now we are going to work on to create bootable USB drive, we will work with Disk 1. Type select disk 1 in the same windows and hit Enter. You will get a message ‘Disk 1 is now the selected disk’. That means, any further operation that you do will affect your disk 1 directly. Type clean and hit Enter to remove all of the data in the USB drive. Clean command will format your bootable drive. You will get a message like ‘Diskpart succeeded in cleaning the disk’. Type create partition primary and hit Enter. You will get a message like Diskpart succeeded in creating the specified partition. Type select partition 1 and hit Enter. 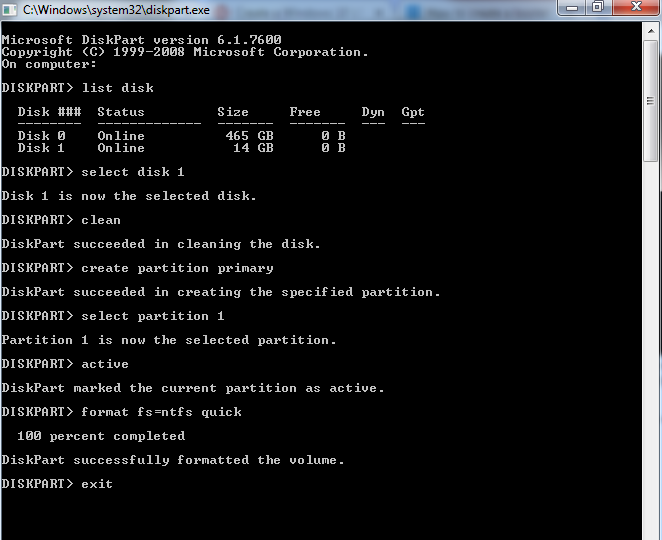 It will choose partition 1 for setting up it as an active partition. Type active and hit Enter. It will activate the current partition. Type format fs=ntfs quick and hit Enter. This command will format your current partition as NTFS file system quickly. Type exit and hit Enter. Exit command will close the Diskpart program. But do not close the command prompt Windows. Now all you need to do open the files inside the DVD or ISO file, copy it and paste inside USB manually. This will make your USB drive bootable.